Just noticed someone asked the question regarding single game tickets on the NHL Seattle facebook page. They stated they indeed would have some singles for gen pop and suggested that anyone interested in single games tickets should join the waitlist (which is free, obv). Good call. I wasn't overly fond of SteelHeads as a name but the thought of chrome helmets just changed the game. Soccer has been Popular here since the 70's with the Original Sounders. On January 22, 1974, the team was christened Seattle Sounders. Went to many a Sounders game, and it was a lot more fun at the Memorial stadium than the Kingdome. was reading an article from the oh-so-trusted media and it was saying most hockey fans in Seattle are newcomers to the city. I have a hard time believing that. LOTS and lots of hockey fans have been in the area for as long as i can remember. Crizilla wrote: was reading an article from the oh-so-trusted media and it was saying most hockey fans in Seattle are newcomers to the city. I have a hard time believing that. LOTS and lots of hockey fans have been in the area for as long as i can remember. Most of Seattle is new to the City, well it seems.. and a lot of them come from hockey towns so it's not surprising to me at all. I"ve really, never have heard one Seattle native, or long time Seattlite, ever say, they wish there was hockey here. We have had several Junior level teams in the areas for years that have been successful, there area a lot of new people in the area to be sure, not why it's popular, most are here because were a sanctuary state now and a hot bed for liberal expression and acceptance, add in the Business growth with Google, Amazon and other support, hardly the Blue Collar support Hockey fans typically are. I will say it's new and the first of it's kind so money people are going top be all in because of the novelty, lets see in 5 years who is attending games. Glad they are getting the seats sold however. Yes you have, I’ve stated it here over and over. Born in Seattle, raised and lived just North of the city limits. I’ve wanted the NHL HERE most of my life. Got quite a few lifelong friends that were born and raised here that feel the same as I. We are here. I played soccer for years when I lived in Washington(70's-80's) and it was popular the whole time. I was a Sounders fan back then as well. When we moved to Indiana I had to end my soccer days as it did not start catching on till the late 80's. Hockey?I liked that in later years when the great one started playing and it grew on me. Had Seattle had a team back then,I would have been a fan. My parents were season ticket holders in the 70's, and I'm a season ticket holder now. I know the history very well. That's my point, Seattle is one of the most affluent and metropolitan cities in the US, if not the world, full of a diverse population of sports fans. So I wasn't surprised at all with how crazy hockey fans went for the season tickets. We're not some meathead closed minded one or two sport city. This is floating around and pretty impressive. The guy behind it done an awesome job! seaky12 wrote: This is floating around and pretty impressive. The guy behind it done an awesome job! Nothing will make that name not boring and unintimidating. In the words of Kylo Ren, let the past die. Also, kudos to you for the Star Wars quote. Just to make it clear, I had no intent to tear down his work, the designs were quality. I just think Metropolitans is a terrible name that is neither unique enough for nor emblematic enough of either the city of Seattle or the Pacific Northwest as a whole. I think the Pilots would be a good hockey name. Not sold on the name but I like the logo with the space needle and the color scheme is decent. The guy did an awesome job overall IMHO. While Metropolitans has not been my favorite team name prospect, I am warming up to it, and Justin Cox did a phenomenal job with his design proposal. One thing I like in particular is that the blue, "Coastal Blue," is conservative so we don't have the dual bold-green-bold-blue thing like the Thunderbirds have. Justin's color pallet is thoughtful and ready to brand an NHL club. The Aviators logo someone did a while back also looked pretty good. 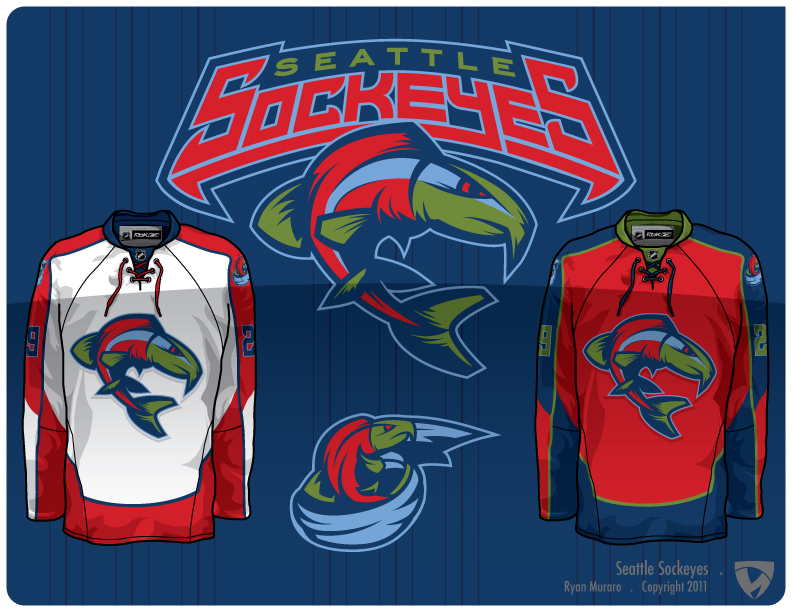 I used to think Ryan Muraro's Sockeyes design concept was great, but looking at it now, it is a bit garish. That guy put a lot of work into that, its impressive. I hope he got a good grade! For me it's a little overboard on the green, that's a lot of green. And obviously I hate that name. I hate that the women took a perfect hockey name.."The Storm"
IndyHawk wrote: I hate that the women took a perfect hockey name.."The Storm"
Good for them for snagging a great name! And 2 other great names that are already taken too. Really not many great names at all available.. I know the Mariners already use the trident logo, but I think it would be cool to go with kind of a Poseiden, god of the sea, theme. Maybe Poseiden holding a giant trident up that becomes the letter I in the name? That was Portland's old name in the USFL. Not a bad name, but we couldn't endure the next 50 years of Portland pukes saying we stole their name. Every time I hear the Breakers name floated around, I think about the Omaha Ice Breakers from Slap Shot 2. I doesn’t sit well with me. I am having a hard time not loathing just about every name I have heard thrown out so far. The Metropolitans most of all, it is a huge yawn for me. Which is a shame, since I am usually a fan of historical things. I also don’t think that we will be able to have blue, and green, as our color scheme, since the Canucks already have it. I think it might end up being purple, and yellow, as there is not currently a team using those colors. They were last used by the LA Kings. Orange and blue, green and orange or a burnt red color. It's a perfect hockey name, far away from the usual bunch of crappy themed names that are out there and.. it's instant classic, timeless and it just sounds good. I dont think I ever saw Slap Shot 2, buy hey the name from Slap Shot 2 ain't that bad. Could be worse, the team could be named after a kids Disney movie about a team named the mighty ducks!! And regarding Portland using the name Breakers before..... eh. Who cares what anyone from Portland thinks. I still really like the Aviators and the different concepts. Especially since it draws on Seattle area history. DJrmb wrote: I still really like the Aviators and the different concepts. Especially since it draws on Seattle area history. Something I haven't seen yet mentioned is the "Seattle Destroyers". Maybe it's too aggressive for Seattle fans and not seen as PC in this day and age? It would be a cool name though to reflect back to the 50+ Destroyer class Battleships built in Seattle during WW2 helping to elevate the US naval fleet to the most powerful in the world. Still to this day this area remains one of the most important US naval areas, protecting America's (and possibly the worlds) largest stockpile of nuclear weapons (in Hood Canal). A team that honors the Seattle area maritime and naval history would be really cool for the area. chris98251 wrote: Orange and blue, green and orange or a burnt red color. Already in use by both the Oilers and the Islanders, otherwise I'd be a fan. DJrmb wrote: Something I haven't seen yet mentioned is the "Seattle Destroyers". Great logo potential there too. Got my priority number in my email today. Higher than I was hoping for (thanks Ticketmaster) but looks like I should be able to get tickets for sure. It would be nice if the NHL officially announce, so we can get a name in place. but.. on the Navy theme.. Anyone remember the TV show Coach ? 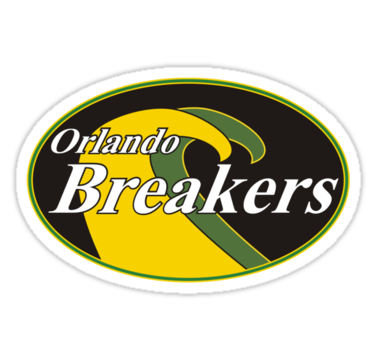 The Orlando Breakers were the NFL expansion team Coach Fox was coaching when the series ended I believe. Chris Hansen bought more land at SODO. Wonder what the plan is there? Would be an expensive FU to the port. Hansen would need a big financial backer too, unless Ballmer is moving home and bringing the Clippers with him. When I here Growlers I think beer haha. However that's not a bad thing! I actually kind of like Growlers. Especially with the great Seattle beer scene! Maybe the historic Admiral theater on Admiral way in West Seattle could show games of the Seattle Admirals on the big screen too! Glasgow Seahawk wrote: Chris Hansen bought more land at SODO. First SODO then Seattle, I will get my arena if I have to buy the whole City!!!!! We could use the military for a few names, Ft.Lewis is around and the navy..
My dad was in the artillery@Ft.Lewis so how does the "Seattle Barrage" sound? 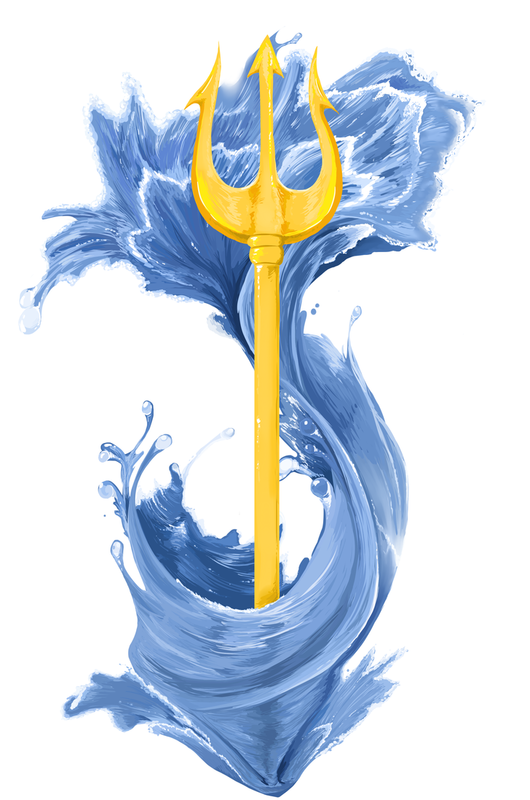 Im telling you guys, Trident, so many cool logo possibilities.